Well after a grueling week and a half here it is. It's not all in the case yet, but at least it's working. I'm very impressed with the temps, and pleased with the results overall. I'm in the process of writing a build log/guide on how to make your water cooling experience as painless as possible. ^ hahaha brilliant idea for the rad box hahahaha. Yeah haha I wasn't using that upper cage and I wanted to save myself the 20 bucks for that swiftech radbox. Brilliant, a brain of its own lol.. The Cheap way. but looks quite good. And if you ignore the bottom section it looks much cleaner! Ohh mibs nicely done. BTW yu should have gotten sum grills in the beginning a lot of my wires were hitting the fans facing towards the back end of the case and " PLUS ONE " for using the Noctua NF-P12 i hope they are pleasing you. anyways em yea man just for safety of your wires and your fingers well i have put my fingers thru the fan several times i must say this is one of them that doesnt really hurt lol. 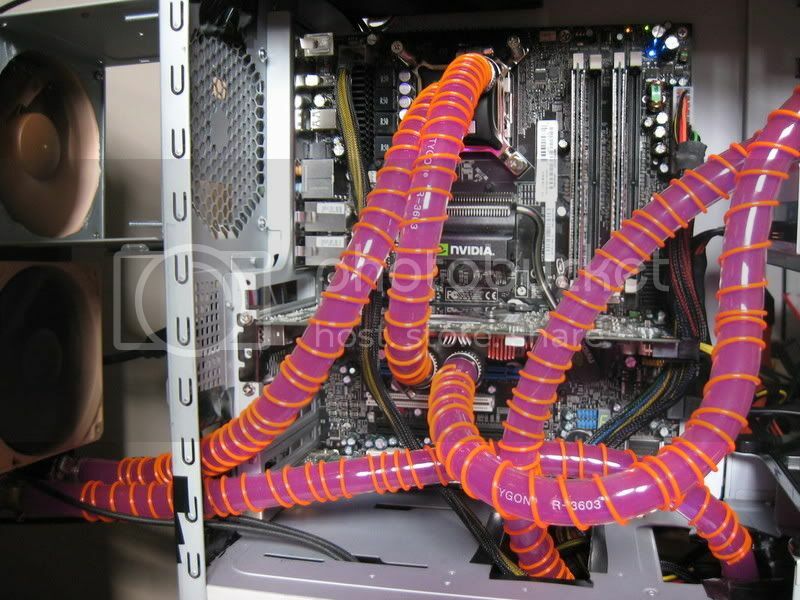 But nicely done i think im gonna rebuild my loop i dont like the placement, but anyways good job and p.s ROFL at using the case as a rad box as long as it works and gives a good amount of clerance for your tubes!!! 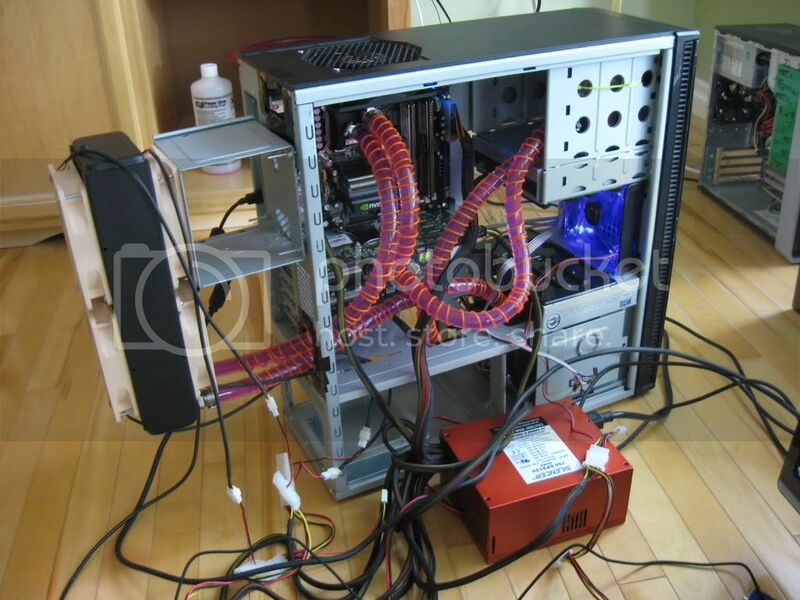 Looks great, but why didn't you cut out a grill on the other side of the "radbox" so that you could still have your 120mm on the rear of the case for component cooling? 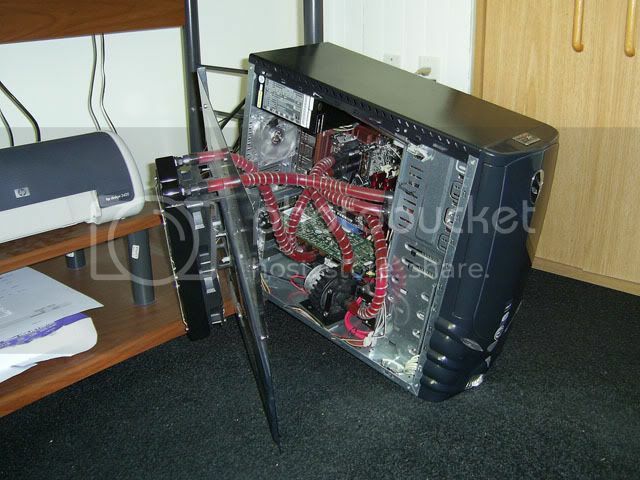 I was thinking about doing that, but there's an exhaust grill on the top of the case that I use for that. I probably should in the future, thanks for the suggestion! Interesting rad mount. I'd imagine it's hard to take off the side panel? I can lay it on its side if I pull the res out. I have a hole in the plexiglass and the bottom rad fan blows inwards. 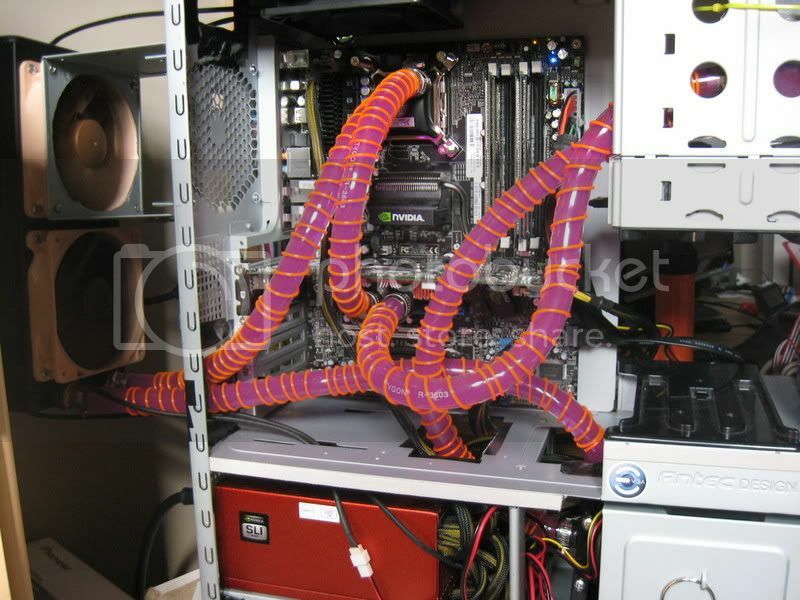 Because my GPU has only ramsinks on the memory, the extra air helps keep them cool. Here's mine, half-way done since 4870 FC blocks are still unavailable. Once I have a couple, I'll add a second loop.